Season's Greetings and New Years are the most popular eCard time of year. But since it's such a hectic time, you may find that you are competing with other companies for your customers' attention. About 10 years ago, I started sending my clients Valentine eCards to let them know how much I ‘love’ doing business with them. It's become a tradition – one that we both quite enjoy! For a retail business, Valentine’s Day can be used as an occasion to have a Valentine-themed sale or to provide promotional coupons and discounts (which can be sent in an eCard). But what if you you're not a retail business? You don't need to have a 'sale' to reach out to your clients and make them feel appreciated. 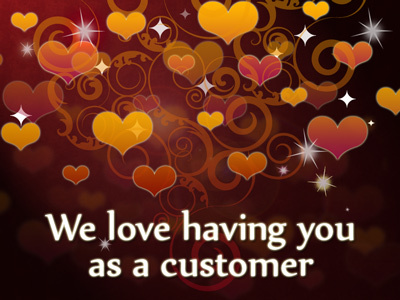 Sending your customers a Valentine's Day eCard that says "We love having you as a customer" is a perfect opportunity. Your customer appreciation efforts are not only heart felt (if you'll excuse the pun), but will help keep your company 'top of mind,' and may remind them to call you for your services. After all, it's easier to expand your existing business than it is to attain new customers. So don't be shy about telling your customers that you love them - they will remember you for it. And don’t forget to post your "Share the Love" campaign on your website and social media, too. With CorpNote, you can easily create and share a Valentine eCard in Facebook, Twitter, Linked In, Google+ and more. (Check out our tutorial on how to share eCards in social media.) And speaking of love, not only do we love to have you as a CorpNote Member, but we also love when we hear back from you! Feel free to leave your comments or give us a call. Do you love using CorpNote? We'd love it if you would share the love by Liking us on Facebook!